The four members of the Mariani Piano Quartet were still studying in Berlin when they first made each other’s acquaintance as chamber recitalists, and their first joint concert at the Hagnau Classical Music Fes- tival on Lake Constance persuaded them to continue to perform together . The Mariani Piano Quartet finally came into existence in the wake of an intensive period of working together at various chamber music festivals in the autumn and winter of 2009 . The Mariani Piano Quartet first came to the attention of a wider audience at the German Music Competition in the spring of 2011 . Their first CD, Phantasy, featuring works by Bridge, Martin and Schumann, followed two years later . The press praised the performers’ “spirit and passion”, their “vitality and delight in their playing” and their “urgent intensity”, adding that they had poured their “lifeblood into literally every note” and con- cluding that “although they are still young, they already perform with masterly maturity” . Among the venues and festivals where the Mariani Piano Quartet has already been in- vited to appear are the Ludwigsburg Castle Festival, the Schleswig-Holstein Music Festi- val, the Mecklenburg-Vorpommern Festival, the Luxembourg Philharmonie, Leipzig and the Beethovenhaus in Bonn, while their de- but recital at the Berlin Philharmonie was broadcast live by the arts channel Deutsch- landradio Kultur . Further recordings were made in connection with their concerts for North German Radio NDR and South-West Radio SWR . Between 1895 and 1899 – together with Maurice Ravel – George Enescu studied composition with Jules Massenet and Gabriel Fauré in Paris. It is fascinating to observe how Enescu continues the spiritual heritage of his teacher and, over time, translates the musical language of Fauré into modernity under the influence of Romanian-folkloristic elements. On this album, the second piano quartet of Fauré was joined together with the first of Enescu. Both pieces, apart from their monumental length, are linked by an „idée fixe“, which is based on almost all themes in all movements. The first notable musical work of the French romanticism, in which this leitmotivic subject processing comes into play, is Hector Berlioz’s Symphonie fantastique (1830). César Franck, one of the greatest role models for Gabriel Fauré, developed this cyclic theme in his works and influenced a compositional style that, among other things, Saint-Saëns and Debussy used in some works. 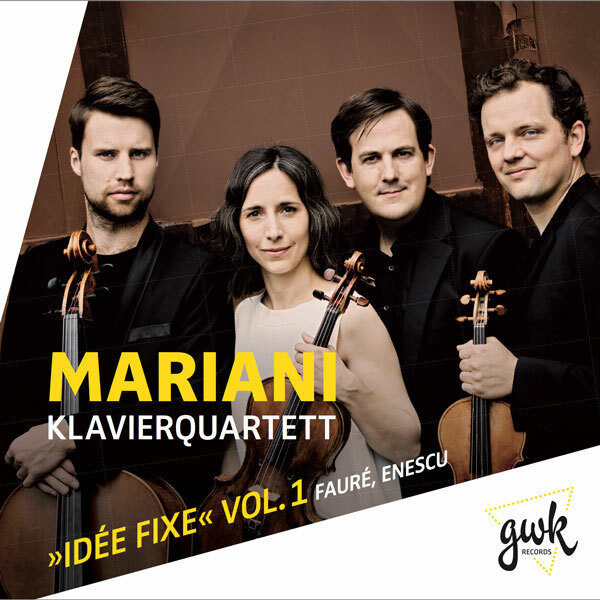 When four young soloists blend together to form such a unity as do the musicians of the Mariani Piano Quartet, then it is something very special. 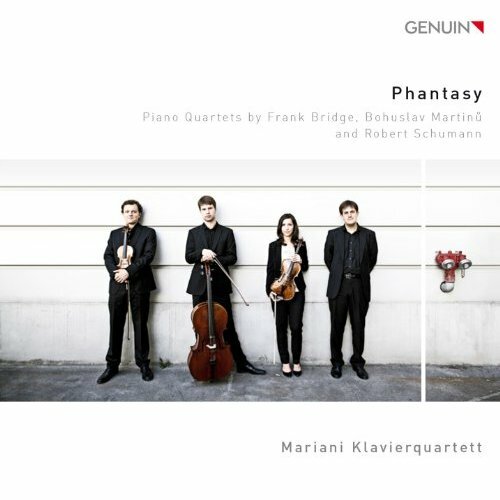 Occupying prominent positions in ensembles such as the Gewandhausorchester and the Berlin Philharmonic does not necessarily guarantee the sensitivity, blind understanding and desire to find one’s own interpretation that they show us in this GENUIN debut CD entitled „Phantasy“. This disc with piano quartets by Robert Schumann, Frank Bridge and Bohuslav Martinů is a mature production, the fire of which never denies the youthfulness of this ensemble, meanwhile showered with international prizes. A must for chamber music fans!